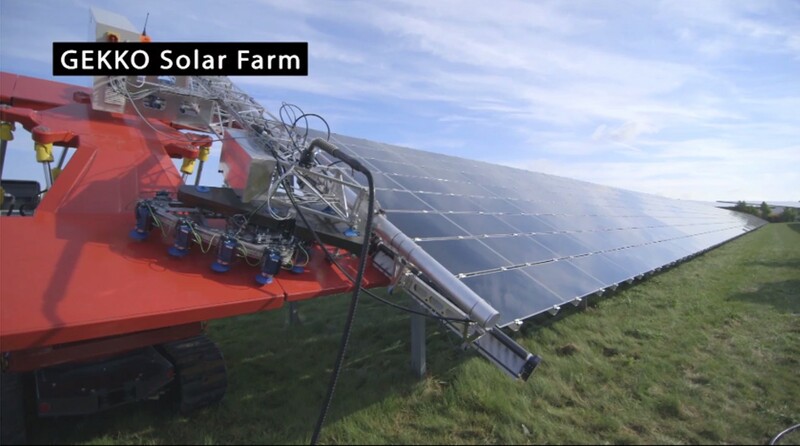 The GEKKO Solar Farm robot is designed for utility scale solar farms. Whose challenges are the dimensions; an automated cleaning solution is a must. Pollution is a matter of economy much more important than for PV plants of residentials. With an efficiency of up to 2000 m2 per hour the robot is very powerful. It's cleaning quality is excellent, due to rotating brushes and demineralised water. The robot can be adapted to different widths of panel rows; the number of brushes and the bracket can easily be reduced. The GEKKO Solar Farm works up to inclinations of 30°. It's able to surmount obstacles of 60 cm in width. The user operates it with radio and joystick. The optional supply car makes the robot independent: power supply, pressured air and water are integrated into the car. A crane moves the robot from one panel row to the other. This big robot also operates on the basis of the GEKKO principle. This „All-in-One” truck is suited for GEKKO Solar Farm applications on different PV plants. It supplies water, pressurised air and electrical power and transports the robot. This solution is offered with truck or without. If there is enough spacing between panel rows this multiuse vehicle is a cost optimized solution. The robot is moved by trailer. Water, air and power supply are integrated in the system. An effective support vehicle with integrated crane: Suited, if there is not much spacing between rows and if the robot has to be often changed from one row to an other. Robot rests fixed to crane during operation. Water, air and power supply are integrated in the system. Instead of water you can use pressurised air and sprays. Brush and air clean the panels. Dust may be collected by vacuum.